You’ll be over-the-moon with the wager-free welcome bonus at Blast Off Bingo! Blast Off Bingo is brand new for Spring 2019 and the latest offering from Lindar Media, which also owns Circus Bingo, Pixie Bingo, and Oink Bingo. Although Blast Off operates on the Dragonfish network, it only hosts promotions that are exclusive to Lindar’s bingo network which means that they’re more interesting and appealing than most. Blast Off Bingo boasts a friend referral scheme, a generous welcome package, 24/7 customer support, and a VIP scheme which is open to all funded members. But can Blast Off actually deliver an out-of-this-world playing experience? Lindar’s bingo sites use fun and unique themes that stand out from other mainstream online bingo brands. This time, the company has chosen a rocket theme. 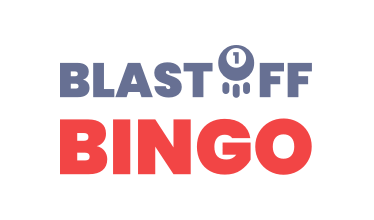 The brand logo uses a bingo ball launching into the night sky in the “O” of “Blast Off”, and right next to it, you have a drop-down menu that allows you to explore the various promotions, bingo rooms, slot game, the VIP page, and FAQs. You also have the option to sign up or log in. An image of outer space is used as the background, which also includes rockets, moons, and stars. The red, white and blue colour scheme looks very smart and gives the website a clean and uncluttered appearance, and the homepage includes details of the welcome package, payment methods, bingo games, slots, promotions, and information about playing on mobile devices. Blast Off Bingo has pretty much nailed it when it comes to customer support. It offers email, a live help room manned by helpful agents during operational hours, and a 24/7 telephone helpline. All newcomers to Blast Off Bingo are invited to claim £114’s worth of free bingo tickets plus 10 free spins when they make their first deposit of £10 or more. You can enjoy access to the “Exclusively Newbies” room for 24 hours after depositing for the first time, and you’re given six tickets for each of the five games that run between 8 PM and 9 PM. You also receive 66 tickets worth £1.50 each to the £1k Pay Day room which opens on the last Friday of the month and offers a prize pool of £1,100. Finally, you can get 10 free spins on the Star Raiders slot. The £1k Pay Day game cards come with zero wagering requirements. However, the Exclusive Newbies tickets do have low wagering requirements, and you can only win a maximum of £1.50 from your free spins. If you’d prefer not to part with your money just yet, you can claim 20 no deposit free spins simply by signing up and verifying your mobile phone number. Every funded roomie gets a special bonus code to use on their birthday, and you can claim a £10 bonus for every friend that you successfully refer to the site. Dragonfish is known as being one of the most reliable and user-friendly software brands in the online bingo industry, so it’s great to see that this is the software platform of choice at Blast Off Bingo. You can pre-buy cards or simply jump in and start playing, and there’s a chat facility and plenty of chat hosts to keep the rooms lively and fun. You can also benefit from side games which can be played at the same time that you’re active in a bingo room. There are Blast Off Bingo apps for both Android and iPhone users available through Google Play and the Apple App Store respectively, which allow you to enjoy the best of Blast Off’s bingo, slots and casino games around-the-clock. You can also play via your mobile device’s internet browser if you prefer. Blast Off Bingo is licensed and regulated by the UK Gambling Commission and the Government of Gibraltar, and displays the eCOGRA logo in its footer. The site uses 128-bit SSL encryption and a secure URL to keep both you and your banking information safe. At the bottom of the website, there are links which allow you to find out more about security, fair play, responsible gaming, and privacy. For bingo fans, there’s a good choice of 90-ball, 75-ball and Swedish-style 5-line rooms, including High 5, Chatterbox, Bingo Buddies, Roller Coaster, and Mystery Jackpots. Ticket prices range from 0p to £1, and there are also daily jackpot games that feature prizes worth £500 to £10,000. There are also mountains of slots (including jackpot slots), scratch cards and casino games to choose from, including Sidebet Blackjack, Mighty Black Knight, European Roulette, Hit Me Baccarat, Cleopatra, Rainbow Riches Pick ‘n’ Mix, Shaman’s Dream, Starburst, Quick Fire Cash, and Wolf Gold. We’re also pleased to see that NetEnt’s live dealer suite is available. The deposit methods that are available include Visa, MasterCard, Wire Transfer, Apple Pay, Paysafecard, Entropay and Paypal, which should be sufficient for most players, but we’d prefer to see a few extra eWallet options such as Skrill and Neteller. The minimum deposit and withdrawal amounts are both £10, and it takes 48 hours for withdrawal requests to be processed. It’s great to see that Blast Off Bingo’s VIP scheme is open to anyone who spends at least £1 of real cash on bingo cards. There are 15 levels to play your way through, and the perks including daily free spins (N.B., up to 50), weekly cashback from level five onwards, and entry to as many as six free bingo rooms. Blast Off Bingo looks set to be another success for Lindar Media thanks to its generous welcome offer, impressive line-up of bingo rooms, slots, table games, and live dealer games, and lively chat rooms. So, engage your warp thrusters, and power up to Blast Off Bingo to claim your welcome bonus now. Blast Off Bingo is owned and operated by Lindar Media, owners of OnlineBingo.co.uk. While reviewing this site, we have remained impartial and stuck to our review guidelines. If you feel we have been less critical of this site, please Contact Us to discuss this at the earliest opportunity. Have you played at Blast Off Bingo? Leave a review and share your experience with thousands of other players. Never miss out on the latest news and offers. Favourite Blast Off Bingo today!